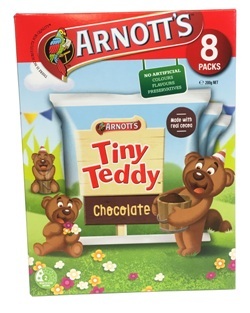 8 packs of Arnott's Tiny Teddy chocolate biscuits. Great fun for both the children and the childish adults! Contains Soy and Gluten containing Cereals. May contain traces of Egg, Milk, Peanut, Sesame and Tree Nut.